The ISPCA is caring for a young female terrier found with horrific injuries to its neck and lower jaw. Gardai received a tip-off regarding the animal’s condition last week and contacted the ISPCA. On investigation the dog was found shut in a shed with its injuries infected and apparently untreated. Worryingly, this is not the first such discovery in recent times. Two weeks ago the Wexford SPCA, an affiliated member of the ISPCA, came across a total of nine terriers at two separate locations with very similar injuries. 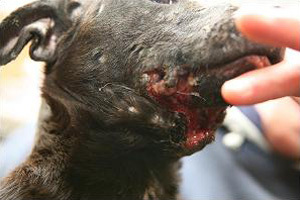 The ISPCA believes that the numbers of terriers discovered with these characteristic injuries is indicative of the prevalence of the illegal practice of badger baiting in Ireland. Mr. Dowling said “It is very difficult to catch these people in the act. We normally only encounter the aftermath of these activities in the form of injured dogs. Some of the dogs have endured the most extreme pain and suffering, not to mention what the badger went through. It is an unspeakably cruel practice”. Despite her injuries and her suspected past, the dog in the care of the ISPCA has proved to be a model patient with a calm and gentle temperament and is responding well to treatment. Enquiries into how she came to be in this condition are ongoing.